Whether at home or abroad, I am a bit of a self-confessed culture vulture (if you'll pardon the cliché). As a Londoner, I am lucky enough to have not only the West-End on my doorstep also but the countries most prized archaeological, historical and artistic gems (all poised and ready for FREE viewing). As culture goes, Bath isn't too shabby either. Holiday planning time is usually spent pouring over guidebooks and the holiday itself, strolling, camera in hand, through a carefully planned itinerary of museums, galleries, castles and backstreet cafes. 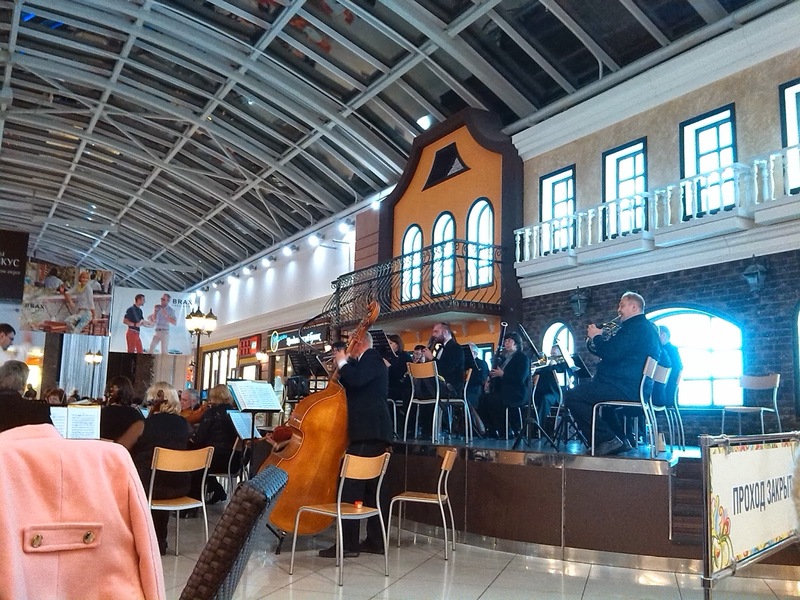 Our cultural escapades began with this rather delightful concert by the Voronezh Philharmonic...in the local shopping centre...in the middle of the food court. We enjoyed wondrous symphonies and hummed along to the scores of our favourite ballets, all washed down with a KFC diet coke. One way to bring high culture to the masses I suppose! 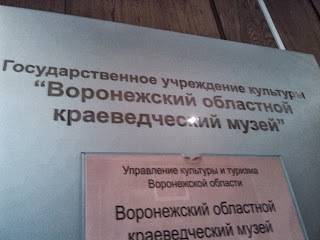 Next on the hit list was the Voronezh Regional Museum. 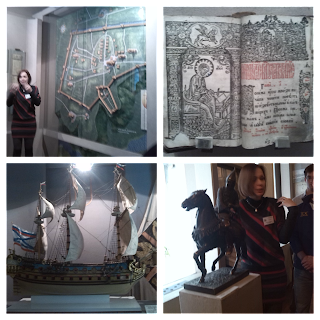 Our culture lecturer organised a guided tour for us (all in Russian of course) as an alternative to our classroom lecture. Starting in the pre-historic period, we wandered through the exhibits from the bronze and iron ages, through the tsarist period, straight through WW1 and in to the revolution and the Soviet era. Some of the things I found most interesting were our guide's explanation of the original settlement of Voronezh, which was created as a walled fortress (artists impression top left), and also the connection to the Tsar Peter the First who built Russia's first naval fleet in the town. My favourite exhibit was surrounding the revolution and also the exhibit of Soviet propaganda. Having taken modules on both Soviet history and Totalitarian Politics last semester, it was interesting to see Russian history told from a Russian perspective. This is my favourite poster from the Revolution exhibit. 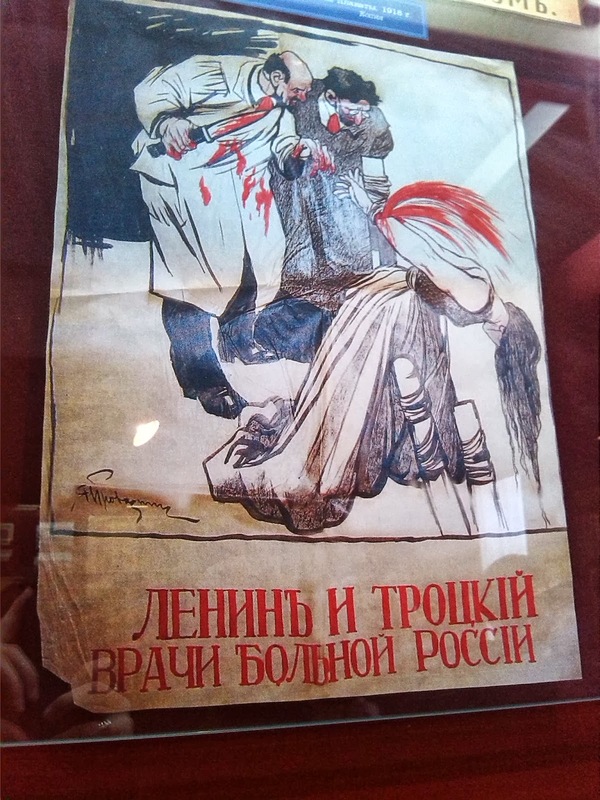 It is quite graphic, featuring a depiction of Lenin and Trotsky slitting the wrists of a woman, who I assume represents the motherland. 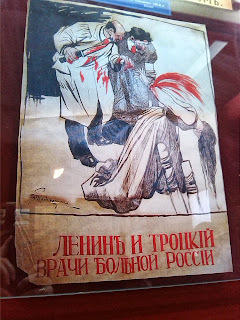 The caption reads 'Lenin and Trotsky Doctors of a sick Russia'. To me, the image and its translated caption don't seem to match. The picture looks like they are trying to butcher the motherland but apparently they are her doctors...cruel to be kind, perhaps? Symbolic of cutting ties with an antiquated and corrupt system to make way for the saviours of Russia? Who knows...interpret as you will. As a lover of the theatre, I was particularly excited when our culture lecturer suggested that we go and see a production of Юнона и Авось (a rock opera/ballet) at the beautiful Voronezh Opera and Ballet Theatre. In preparation for the show, our spoken language lecturer told us the story. It's a beautiful, true love story set in the 1800s in San Francisco. Nikolai Petrovich Rezanova, a naval captain, sails from Russia to America to improve trade relations. Whilst he's there he meets Conchita, the sixteen year old daughter of the town's governor, and the fall in love. Though they want to marry, Conchita's parents forbid it as he is an Orthodox whilst she is a Catholic and they also don't want her to leave to live in a snowy, distant land. Going against her parents wishes, they are engaged to be married but Nikolai must return to Russia. He tells Conchita to wait for him and that he will come back for her. When he reaches Russia, he get sick in Siberia and dies. Conchita never hears of his death and continues to wait for him for nearly 40 years. A sad but touching story, I think you'll agree. We were told that the show would be a modern representation of the classic story. 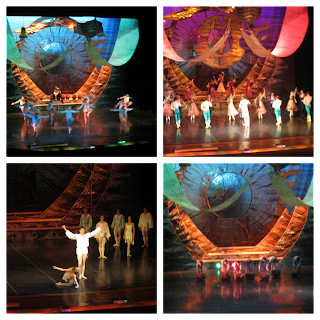 I absolutely ADORE the ballet. 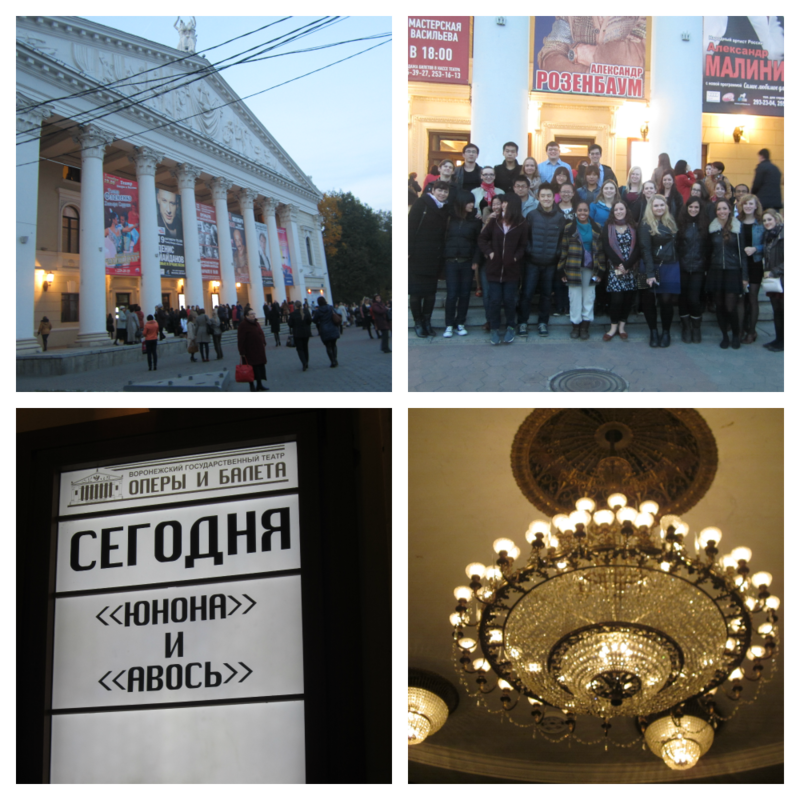 I have seen many performances, both classical and modern. Even if I don't like the style of a ballet or I don't really understand the story or message it is trying to convey, I can still appreciate the technical skill behind what the dancers are doing. I can safely say that this was no such occasion. There is dancing with abandon (in a stylised way) and there is just not knowing where you are going to land or whether you are going to knock over the person next to you. 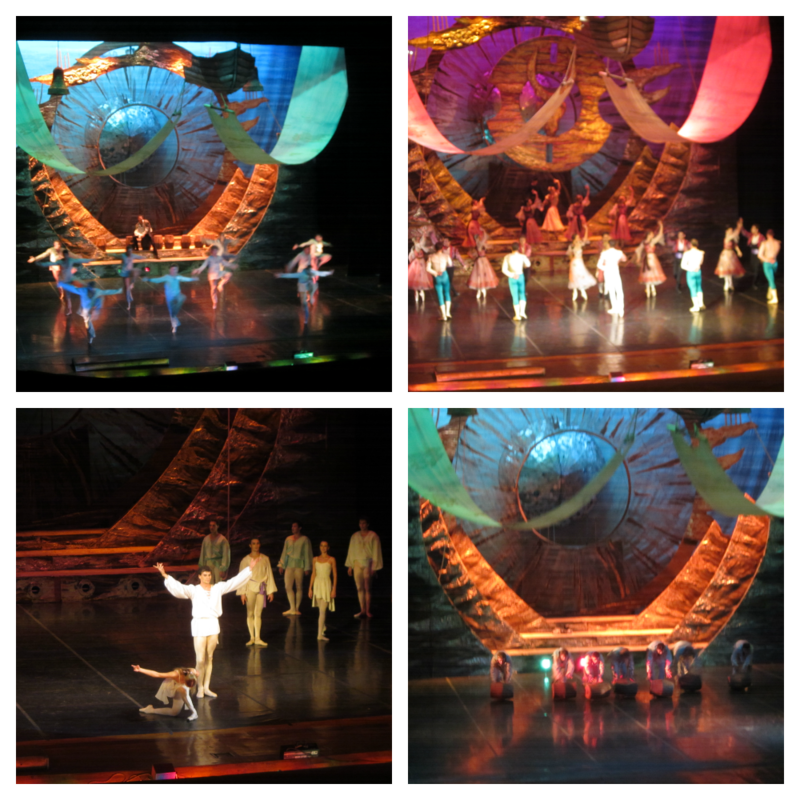 This ballet was the latter. There is choreography which is meant to evoke chaos and there is actual chaos. This was again the latter. I am by no means a ballet snob (though I absolutely sound like it!) - I have been to plenty of amateur productions that I have really enjoyed. This, however, was a professional performance, not carried out to a professional standard. There were some stand out dancers - namely Conchita - but the chorus left a lot to be desired. Only one word for this one: OBSCURE! After a late night, we had an early morning (and 3 hour bus drive) to go on an excursion to Divnagore. A national park close (in the Russian sense of the word) to Voronezh. It boasts beautiful view of the River Don and the surrounding countryside, the remains of an old fort, a beautiful chalk canyon and (the highlight) a chalk church and accompanying monastery. Here are some of my favourite snaps. Chalk church protected by a beautifully painted icon of the Virgin Mary. Legend has it that during a cholera epidemic a few hundred years ago, a woman from a village in the valley below dreamt that the cure for the disease would be found through prayer to the icon of the Virgin Mary of Sicily, located within the monastery. The monks spent ages searching but couldn't locate the icon, until someone remembered having seen it above the door way of one of the churches. Prayers were uttered and townspeople were cured. The church still houses the Virgin Mary of Sicily, but it is a reproduction - the original lost somewhere in history. Views of the Don from the remains of the fort. Just as I thought my historical journey was through for the week, our Russian work colleagues took us to this beautiful spot. In 1879, a political group met in this park to discuss what was to be done about the reforms of radical Tsar Alexander the Second. The party was split in its views one half wanting to impose its views through parliamentary measures and the other feeling that terrorism was the only way to break the cycle of reforms which they opposed so much. Each went their separate ways. The terrorist arm of the party later went on to assassinate Alexander the Second in St Petersburg. This memorial remembers the historical significance of that meeting in the park. Here you can see the ruins of what was once one of Voronezh's premier concert venues. During a concert of Russia's most popular bands during the soviet period, things got out of hand - whether the crowd was to rowdy, or trouble broke out, no one knows but somebody was killed. Later, the theatre was torched in an arsene attack and the culprit was never caught...perhaps the mother of the killed concert goer got her revenge? The ruins have been left to grow over but the catacombs that are beneath them are the scene of many a Halloween dare. What better place for a staff meeting than sat on logs on a balmy autumn day enjoying the colours of the trees?